Non refundable £50 deposit to secure booking. This will also act as a bond, which to be returned within one week at end of holiday. following our holiday home being checked over for any breakages. Balance to be payed 6 weeks prior to holiday. Once holiday is paid holiday can only be cancelled and refunded if holiday is re sold. we have a very strick no smoking and no pets policy which is for our family, friends and guests comfort. Park complex is closed after the end of October, therefore prices will be £60 per night in Nov & Dec.
We have based dates on Mon - Fri & Fri - Mon. we can accommodate one baby as only space for one travel cot. If you are planning on bring a baby could you let us know so we can bring correct bedding & set up cot for your arrival. if the infant is old enough to sleep in a bed cot rails can be hired from the customer services. 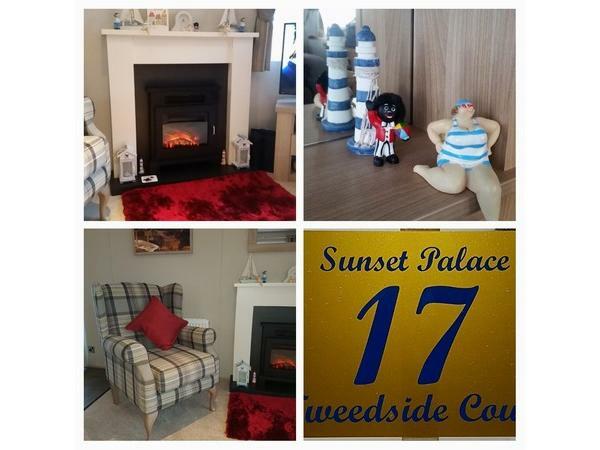 The Carnaby Helmsley lodge is a 3 bedded caravan 39 ft by 13 ft and sleeps 6. The van has been given a “platinum” rating. It has double glazing and gas central heating throughout. The contemporary style lounge is very spacious and has a beautiful modern fireplace with an electric fire. The lounge has a 43” smart TV with usb media player and DVD player. We provide free wii fi and has alexa for your music experiences. It is furnished with a lovely comfy sofa and modern matching arm chair. The Patio doors in the lounge leads out onto an 8ft wrap around style veranda (with lockable gate), with contemporary outside furniture. We have private parking for one car, a patio area ideal for barbeques and a secluded grassed area which is perfect for children to play on. The wrap around kitchen and connecting dining area feature stunning high-gloss surfaces and domestic quality appliances. Integrated microwave & integrated fridge freezer, and gas cooker. 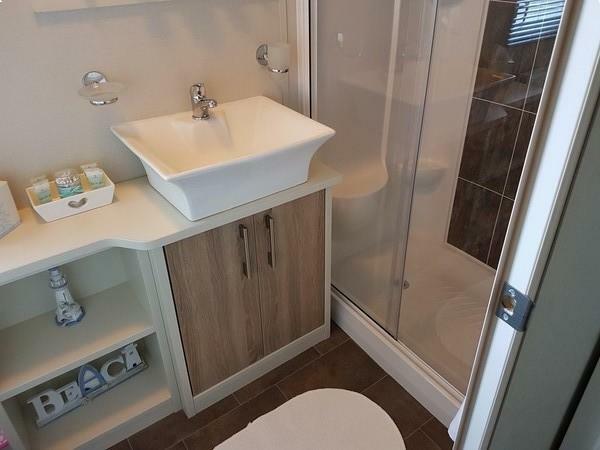 The main bathroom has a modern unit and a good sized cubicle with a powerful shower. The master bedroom has a double wardrobe dressing table unit & en-suite facilities. All our single beds have toppers for better comfort. It also has space for a travel cot at base of bed (included on request). And a wall mounted TV with DVD combi. The other two bedrooms both has twin beds with single wardrobes. Additional Info: There is lots to do on site at Berwick holiday park. This is for the young & old alike facilities include:- Indoor pool / water sports outside pool weather permitting splash zone, play area, Archery, Fencing, Bungee trampoline jumping, Nature rockz, activities for kids. Seaside squad kids club, Day and night. Pottery painting / sand art, Laundrette, Indoor bowling, Bingo nightly adults only at 5.30 pm then family bingo later, Late night bar at weekend, Karaoke on weekend, Live music in pub, Food & drinks Nisa supermarket, Fish & chip shop, Briggs on tweed Pub / restaurant Newly furbished show bar for 2017 Berwick hosts 3 lovely beaches and nearby Spittal beach is also lovely. The golf course next door Magdalen fields is a good attraction for golf lovers. Its only a 10 min walk to town with nice shops and plenty of places to eat. Perfect if you want to leave the car parked up for a few days and take in the breathtaking views of the coast line and river walks. Thank you Pat and Alan for letting us stay at your beautiful caravan. It was spotlessly clean. Definitely home from home. Loved all the little seaside knicknacks, decor lovely. Bedding gorgeous with such a lovely fresh smell. 2 toilets and sinks which is great when there are 6 of you. Kitchen equipped with everything you need and more,even sauces, condiments, tea coffee, sugar etc. Large fridge freezer. Cooker, microwave. Loved the Tassimo coffee maker complete with coffee pods - we came home and bought one so impressed with it. Shower was fab with nice size cubicle. Lovely big wrap around balcony, just a shame we couldn't get to use it as we had snow, sleet and heavy winds when we were there. But we all kept nice and warm with the heating system. Nice to see one of the twin rooms with full size single beds so ideal for adults or children. The double room is big with loads cupboard space, drawers etc. with en-suite loo and sink. We also had access to the outside shed with bikes and scooters to use. The kids (8 and 14) thought that was great. This caravan is well worthy of its 10 stars. So good we have already booked to go back in couple weeks time. Pat and Alan are so friendly and approachable, nothing is too much trouble for them. Cant wait to go back and hopefully weather will have improved to sit on the lovely furniture on the huge balcony. We have just returned our family holiday in this wonderful caravan and its superlative surroundings. The caravan itself was spacious, clean (inside and out) and provides everything you would need for your stay and more. Its location on the site is excellent, a 2 minute walk to the main complex and situated in a quiet cul-de-sac which means you don't get many people walking by, particularly in the early hours. Internally the main living area is tastefully decorated and plays on the coastal theme which was a nice touch and overall is presented very nicely. There is central heating with radiators in all rooms for when it was cooler, all of which can be individually turned off. The living room features an extremely comfortable corner sofa with a single armchair to compliment, both are perfect for lazing around. The kitchen was very well equipped and has everything you need even down to condiments, all you need to do is buy the food which can be kept in the large fridge/freezer. The three bedrooms offer a variety of bed sizes from the master double bedroom to the 2 x twin rooms, one of which has larger normal size beds which is an added bonus. The master bedroom also offers an en-suite and a TV on the wall. There is ample wardrobe / storage space across all rooms with hangers provided too. Externally there is an abundance of space both in the form of a large veranda with table and chairs or a large patch of grass adjacent which is sheltered by large hedge to provides a good boundary when looking after the children and also offers a level of privacy. The booking process was swift and the owners quick to answer any queries. They also offered suggestions of activities to do both on and off the park which was great and is certainly worth asking as there are plenty of hidden gems around to explore. Some of these we visited included Holy Island, Chain bridge Honey Farm, Etal castle (there is a nice river there too where kids can plodge! ), Eyemouth & Spittal sea fronts to name a few. If your lucky you will catch the local seals up in the harbour at Eyemouth. The park itself offers plenty of entertainment day and night for those not wanting to venture far with amusements, swimming pool and a plethora of activities available to book for additional charges through the park itself. Our children enjoyed the nature rockz activities which see the kids being taught about nature through activities such as scavenger hunts and nature trails and even fire building. There really is something for everyone of any age. The night time entertainment was excellent with kids shows, bingo and adult entertainment later in the night; all of which varies each night. 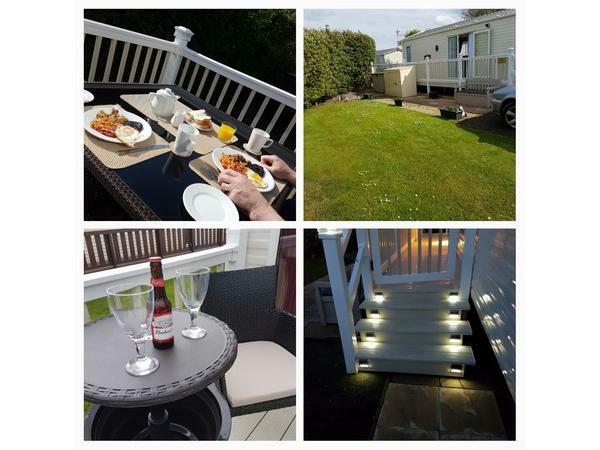 Overall we had an excellent stay, the caravan was superb, the site excellent and the surrounding area has plenty to offer should you wish to explore it. We would genuinely stay here again.